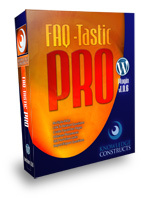 UPDATE: FAQ-Tastic has now moved – please visit the new FAQ-Tastic website for the new FAQ-Tastic Lite and FAQ-Tastic Pro plugin for WordPress. The plugin has been extensively updated and now runs on WordPress 2.5 (Brecker). There is also now a new FAQ-Tastic User Manual (32 page PDF file) that will help you get started with FAQ-Tastic. We’ve even provided you with FAQ-Tastic product shots (like you can see on the left) that you can use on your blog posts if you like! Please update your bookmarks and feel free to blog about it. Built with search engine optimisation in mind, our FAQ plugin enables the SEO-conscious Webmaster or Internet Marketer the flexibility to customise the questions to ensure all links contain any necessary keywords. With an added CSV export function, our FAQ-Tastic WordPress plugin also allows you to export questions and answers (extremely useful for the creation of “fly-catcher” pages!). FAQ-Tastic also allows you to customise various options like the “Thank you” message or even the default notification email, so now you have even more control over WordPress with this plugin. FAQ-Tastic is built for WordPress 2.1+ only. Download FAQ-Tastic version 0.9.3 zip file (no longer available – please visit the link above for the new free version of FAQ-Tastic Lite.. Extract the zip file contents and upload it to you WordPress plugin directory (/wp-content/plugins/). Log into your WordPress Admin area and click on the Plugins link. Click on the “Activate” link for FAQ-Tastic. Note: you will immediately be taken to the “help” area of FAQ-Tastic when activated. The FAQ-Tastic admin area can be found under Manage / FAQ-Tastic in WordPress. Please see our WordPress FAQ-Tastic plugin user guide. Leave a testimonial and/or let other users know about how you’ve benefited from using FAQ-Tastic. You may not sell the new version. FAQ-Tastic is intended to be free to benefit the WordPress community. If you wish to be paid for your efforts, then please ask for a donation. You must clearly state the original author within your editorial copy and make a link back to this page.